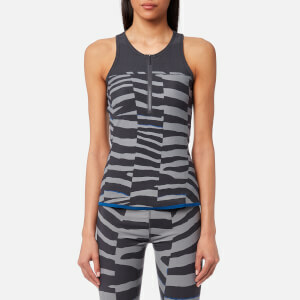 Women’s sleeveless running top from adidas by Stella McCartney. Crafted from sweat-wicking Climalite fabric, the top comprises a miracle cut line at the front with signature shiny scuba panels at along the sides and mesh inserts at the back for enhanced Climacool function. Detailed with a crewneck and racerback construction, the tank top features an elasticated ham-band with tonal rubberised branding. Reflective snake-print tape accents and rear logo patch elevate the design.